body. They help shore up the bones, heal wounds and support your immune system. They also convert food into energy and repair cellular damage. Vitamins also play a vital role in the development and formation of teeth. Let's see how does vitamin deficiency affects our oral cavity and sources rich in vitamins. Deficiency of Vitamin A causes delayed eruption of teeth and delayed bone formation of jaws, white patches in the mouth. Foods rich in Vitamin A are cooked sweet potato, carrot, dark leafy greens, red bell pepper, mango, whole milk, peas, tomato, dried apricot. Deficiency of Vitamin D causes improper formation of tooth structure, delayed teeth eruption, improper alignment of the teeth. Foods rich in Vitamin D are fish, mushrooms, orange juice, egg yolk, soymilk. Foods rich in Vitamin K are green leafy vegetables, spring onions, chilly powder, cucumber, soya beans, olive oil. Deficiency of Vitamin C causes inflamed gums leading to redness and bleeding, ulceers formation, fou breath, bone loss, loosening of teeth. Foods rich in Vitamin C are berries, cabbage, citrus fruits, kiwi, melons, peas, pineapple, spinach, sweet potatoes, tomato. Foods rich in Vitamin B2 milk, cheese, leaf vegetables, mushrooms, almond, lamb's liver. Get the right amount of vitamins to keep your teeth and body healthy. Invisalign is an orthodontic treatment method which uses a series of clear and removable teeth aligners as an alternative to the traditional orthodontic braces. What is orthodontic treatment and why is it required? 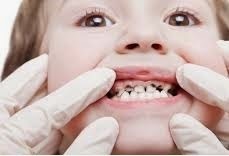 Orthodontics is a specialized branch of dentistry which deals with correcting various kinds of malocclusions such as correcting the bite, incorrect spacing between the teeth, correct a crooked tooth or aligning the crowded teeth. All these malocclusions can be corrected through an orthodontic treatment, which involves the use of metal/ceramic braces or clear aligners such as invisalign. It is very important to correct these malocclusions as mal occluded dentition has many bizarre affects on our dentition and the oral cavity as a whole. You might end up with tooth decay or gum disease which can deteriorate the health of your gums causing gum bleeding, bad breath and may also lead to loss of teeth. Studies show that these oral infections can lead to many more serious ailments such as diabetes, heart diseases, and pregnancy related problems. Straightening your teeth will also enhance your smile which boosts your self confidence, and also helps to maintain your oral hygiene, thus preventing the plaque buildup and tooth decay. Invisalign are a set of invisible, removable aligners that will be changed approximately every two weeks with next set of aligners. These aligners are individually fabricated for your teeth. You will be examined and instructed by your dentist during your appointed visits. You will be provided with a new set of aligners as your teeth moves little by little until they acquire the desired positions. Invisalign is the best way to achieve the desired treatment without interfering with your day to day life. The duration of the treatment can be approximately one year, but as each case is different, the duration of the treatment may vary. After the treatment, you will be provided with a set of retainers to be worn at least during the nights which will be similar to the invisalign appliance. These retainers hold your teeth in its new position, as after the orthodontic treatment the teeth have the tendency to revert back to their previous positions. These retainers will help to establish the corrected teeth position. Why choose invisalign over a traditional metal braces? 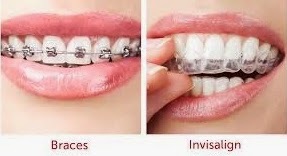 The major concern when one has to undergo an orthodontic treatment is the discomfort and the unpleasant look caused by the conventional metal braces. This can be overcome with invisalign. This appliance allows you to do your day to day chores like brushing your teeth, eating the food without causing any hindrance. As invisalign are clear and invisible braces, it allows you to smile with confidence and is very gentle to your gums and cheeks. It also keeps you away from mouth ulcers, pain and discomfort that are generally caused by the metal braces. The aligner trays are removable, and comfortable to wear. It has to be worn at least for 20-22 hours a day. One more advantage of invisalign is that there are no food restrictions during the treatment, so you can bite onto your favorite candy, nuts and any hard foods that are usually restricted with metal braces. You can remove them when you are brushing or flossing. What cases can be treated with Invisalign? Some malocclusions which can be treated with invisalign are crooked teeth, widely spaced teeth or crowded teeth, overbite, under bite, open bite and cross bite. Teeth Spacing or crowded teeth can lead to gum problems and if left untreated can lead to periodontal disease which will affect the teeth and the surrounding bone. Overbite is a condition where the upper teeth cover the lower teeth which may be caused by improper oral habits, hereditary, or abnormalities in the jaw bone. If not treated can lead to jaw pain, tooth decay, interfere with speech and cause wear of teeth. Under bite is a condition of lower jaw protrusion beyond the upper jaw which causes the lower teeth to overlap the upper. This may be caused due to large lower jaw, oral habits such as tongue thrusting, which pushes the tongue against the lower teeth leading to lower jaw protrusion. Mouth breathing can also cause under bite. If left untreated it also leads to tooth decay, wear of enamel and pain in jaw joint. Cross bite is a condition where teeth are reversely placed which leads to abnormal positioning of one or more teeth of one arch to opposing teeth of the other arch. This may be caused due to misappropriate jaw size, retained milk teeth leading to ectopic eruption of permanent teeth. If left untreated it may lead to gum problems, tooth decay, asymmetric growth of your face. Open bite is a condition where teeth are unable to make a physical contact with the opposing teeth. This condition may be hereditary, or caused because of oral habits such as thumb sucking. If left untreated it may lead to difficulty in chewing and jaw joint problems. Invisalign appliance takes us to the next level of modern orthodontic treatment which provides the comfort and convenience during the treatment. It overcomes all the problems that one faces with a traditional orthodontic treatment with metal braces yet keeping the treatment as effective as the metal braces. If you happen to observe your kid showing unusual symptoms, rejects to have his favorite food, irritated and disturbed, fever, tiredness followed by puffing of cheeks, then you can suspect your child to have a viral infection called mumps. Mumps is a sudden occurring viral infection usually spread through saliva, affecting the parotid salivary glands. There is pain and swelling of the salivary glands on one or either sides in front of and below each ear and sometimes swelling of glands near the jaw line is also observed. Mumps is highly contagious, spreads easily from person to person by sneezing, coughing and talking or touching the surface covered with infected droplets. It can be contagious from two days prior to the symptoms to 5 days after. The child needs to be isolated until he/she is no longer infectious. The infection generally lasts for 7-14days and resolves gradually. There is no specific treatment for the infection. Palliative care like giving hot and cold packs for the parotid gland pain and swelling can be given. Pain relievers can be given. Make them drinks lots of water to maintain hydration. Mumps can be prevented by vaccinating your child with MMR vaccine (Measles-Mumps-Rubella) given in two doses. This may be done at 12 months and 18 months or 15 months and 4-6 years. The most ignored or neglected part of our body is our teeth. Most of us wonder why is it important to replace one missing tooth when there are other remaining teeth. Let’s discuss that in detail of what happens if the missing tooth/teeth are not replaced. Our teeth are designed to work together to help us chew the food, speak and smile. When tooth/teeth are missing, there is a hindrance to all these actions. Missing tooth if not replaced will lead the adjacent teeth to shift to the empty space and create areas that are difficult to clean which eventually leads to gum problems and tooth decay leading to further tooth loss. It can also lead to excessive wear of these teeth. It can also lead to bite problems, when the upper and lower jaws don’t meet properly it can cause damage to the jaw joint. It can affect your general health, especially if your back teeth are missing, it may be difficult for you to chew certain foods which can lead to malnutrition and recurrent illness. To avoid all these ill effects, it is very important and essential to replace the missing tooth/teeth to keep you fit and healthy. Advancements in modern dentistry have made it easier to replace a missing tooth using natural looking and functioning prosthetics. There are different treatment methods to replace missing tooth/teeth which varies from case to case. It is always advisable to visit a dentist and discuss the treatment option that suits you the best.